The Re-enactment of the Boston Massacre and more..
History is something to be watched when the probability of occurrence rests at 50%. Trust me folks, Philly winning last night HAD to occur for all of our sakes as hockey fans. 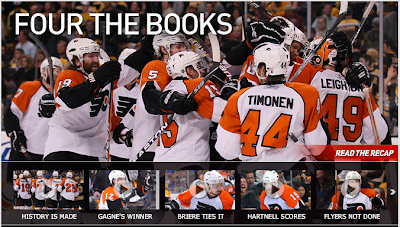 Sure we have to hear about the Flyers for a while but that's far better than having to revisit old stories from this past season. We all have our hopes about what the finals will work out to be, personally I would love an Original Six Matchup. We haven't seen one of those since the 1978-79 Season, when Scotty Bowman's Montreal Canadiens defeated Fred Shero's New York Rangers 4 Games to 1. 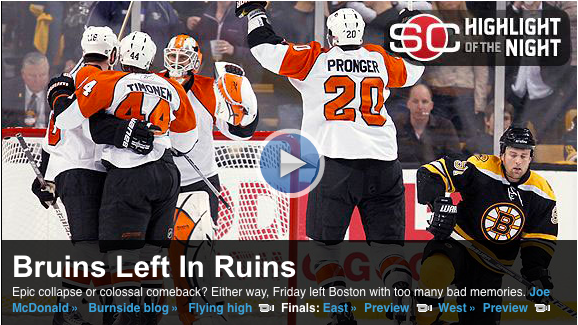 Say what you will about the NHL regular season, but the Playoffs never cease to have spectacular stories!